The Tour de France is one of the biggest sporting spectacles in the world. In terms of spectators getting to see the event live, it has no parallel – with millions lining the roads of France and Europe throughout the month of July. 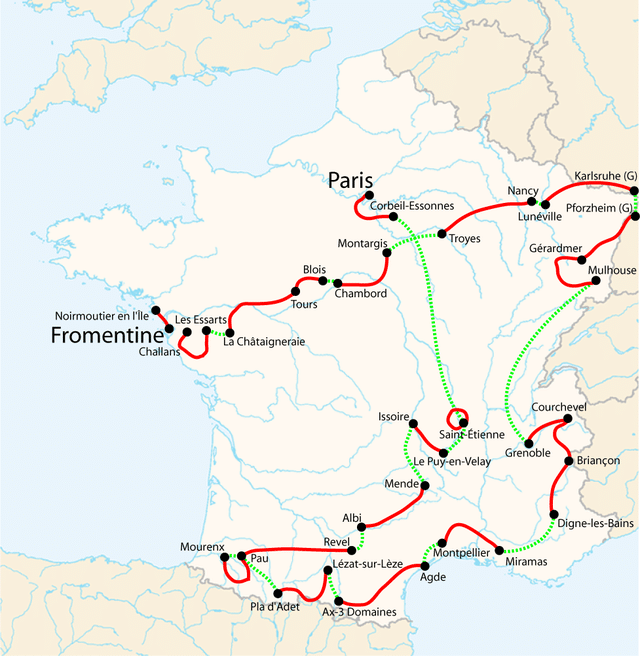 In 2013 – a caravan of 4,500 people including organisers – teams – media – partners – publicity caravan – providers made up the tour. This excludes many volunteers and local council workers who help to get the tour ready. Average time by road side – 6 and a half hours of presence on average on the road-side. 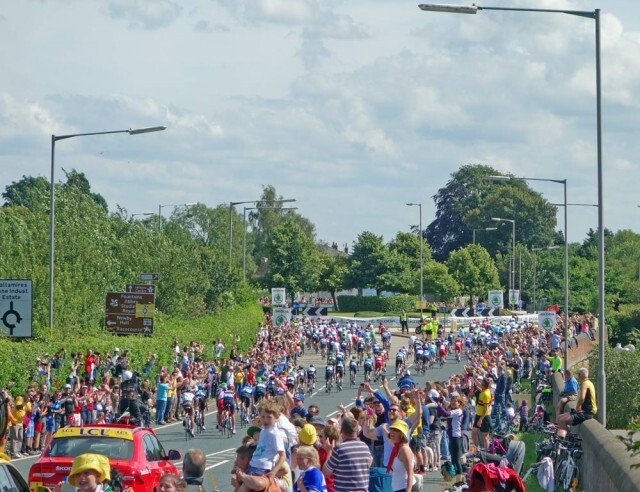 An estimated 2.5 – 4 million fans lined the roads to see the Tour de France cover two stages in Yorkshire. The early editions of the Tour de France helped French gain a better sense of national unity and geographical identity. Modern versions are roughly about 3,600 kilometres (2,200 miles) spread out over three weeks. Early Tours were longer. In 1926, riders had to cover 5,745 km over 17 stages. The longest ever stage in the Tour de France was on 7th July 1919 – 482 km (300 miles) won by Jean Alavoine from Les Sables-d’Olonne to Bayonne. Average speed in the Tour de France? In 1926, the tour winner averaged 24 km/h over the whole 5,745 km. By comparison in 2010, the average speed was just under 40 km/h for the 3,642 km. What Does the Yellow Jersey Mean? The yellow jersey is worn by rider at the top of the overall classification. (the quickest time over the combined stages so far). The yellow jersey was introduced in 1919 several years after the Tour started. It was chosen it was felt the yellow jersey would help identify the leader to spectators on the road. Yellow was chosen because the newspaper L’Equipe which sponsored the Tour was printed on yellow paper. The first yellow jersey wearer was Eugène Christophe in 1919. 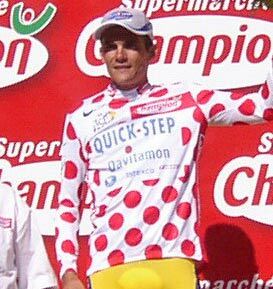 (see: birth of yellow jersey) Some riders said they were offered a yellow jersey in previous years but they didn’t want to wear it. Can you win the Tour de France without winning a stage? What is the King of the Mountains Competition? A separate competition within the Tour. Riders are given points for being the highest placed rider over the summit of mountains. The best climber was first recognised in 1933, and the distinctive white and red polka jot jersey was introduced in 1975 to show person with most points in the King of the Mountains. For example, on the most difficult climb (hors category) e.g. Alpe d’Huez a rider is given 20 points for being 1st and 16 points for being second. For smaller and easier climbs less points are available. What is the Green Jersey for? The Green jersey is awarded for the leader of points competition. Points are awarded for placings in stages. e.g. in a flat stage finish 1st place gets 45 points, second place gets 35. You can also pick up points during intermediary sprints during a stage. The green jersey ignores overall time and just the number of points you pick up at end of stages. It tends to favour sprinters because they tend to finish high up in the majority of stages. 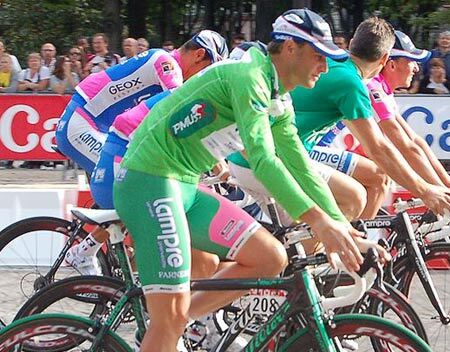 However, the wearer of the Green jersey needs to be consistent and pick up points on many stages. To win the green jersey you have to make it over all the mountain stages and finish in Paris. Some sprinters like Mario Cippolini won many sprints, but would retire in mountain stages. In recent years, the competition has been dominated by Peter Sagan – not the fastest sprinter, but a good all round finisher. The competition was introduced in 1953 to celebrate the 50th anniversary of the Tour de France. What is the White Jersey for? Introduced in 1952, the combativity award is given to the rider on the stage who is considered by a jury to be the most attacking and aggressive racing. This tends to reward riders who get into a break for the longest time period. The winner of the day is awarded € 2000. For the next stage, the rider is given a white number on a red background. At the end of the Tour, a rider is awarded the “super-combativity award” for most aggressive rider of the tour. Riding behind another rider saves unto 25-30% of your energy. In some cases, right in the middle, it is estimated you can save up to 50%. If you ride ahead of bunch you will need much more energy. Therefore it is very difficult to ride off on your own away from the bunch. However, some riders will try to win the stage and get into a break ‘a group of a few riders’ trying to get to finish before peleton. How many minutes behind the leader does it take to be eliminated from the tour de France? Riders have to finish within a certain time frame, otherwise they get eliminated. This is calculated by a % slower than winners time (see above) On tough mountainous stages, riders may join together to try and make sure they are not eliminated. The autobus is usually the last big group on the road. Also by being in a big autobus, riders hope that on really hard stages, even if they finish outside the time limit the Tour organisers won’t dare eliminate half the field. If more than 20% of riders fail to make the time limit, the organisers can review the time and decide to give them more time. Why don’t they do every stage as a Time Trial? A time trial or contre-la-montre, (“against the clock”, or literally against the watch) means riders rely solely on their own efforts. There is no chance of race tactics or hiding in bunch. Arguably, this is truer sporting test as the strongest rider wins. However, it is not the most spectator friendly event. The race tactics and speed of bunch sprint is much more exciting than repeated time trials. Therefore, they are usually limited to one or two. Most riders in the tour have no chance or expectations of winning. Therefore they act as ‘servants’ or ‘support riders’ for their team leader. They will drop back to pick up water bottles ‘bidons’ from their team car and then bring them back to their leader. If a break needs chasing down, ‘domestiques’ will work on the front enabling the team leader to save his energy for later. In some circumstances they will be expected to give up their wheel or even their bike to save their leader time. It is hard to win the Tour without a very committed team of domestiques willing to sacrifice themselves for their team leader. It is said Lance Armstrong’s dominance was built around a team with unflinching loyalty (though that loyalty didn’t extend to belated doping allegations). Also, there are domestiques and there are super-domestiques. It sometimes happens that the domestique turns out to be stronger than the team leader (Hinault and LeMond in 1985). Froome v Wiggins 2012. This can be embarrassing all round. The moment of greatest interest in the 2012 tour was when the loyal Froome – dog wanted to let go of his leash and started ‘attacking’ Wiggins. Wiggins was said to be in near tears at the end. Though in the time trials, Wiggins was able to dish out his power and show Froome who was the boss. Domestique getting water bottles to carry. Usually, you want to ride behind another rider to save energy. However, in a very strong side wind you want to ride by their side. Therefore in a strong side wind, everyone tries to ride to the side of another, leading to these diagonal looking ‘echelons’. This can be dangerous for leading contenders because the peleton is split up into different groups and they can drift away from main pack. Are you allowed to cover part of the course on foot? 2016 stage to Mont Ventoux was very crowded because the finish was moved 6km downhill due to high winds. What is the Lantern Rouge? The last rider overall on general classification. For a time the lantern rouge would carry a little red light under their saddle. It became paradoxically a cool thing to be. Lantern Rouge’s would gain more fame than person second to last. For a few years in the 1940s, organisers experimented with sending the last rider (lantern rouge) home to try and discourage this unofficial competition to be the lantern rouge. Even now some riders really don’t mind being lantern rouge as they are domestiques and it means at least they are still in the race. There can even be a little light competition to get lantern rouge. De las Cuevas is so far down on GC you could time him in with a calendar! Why is Mark Cavendish not in the lead despite winning so many stages? The overall leader of the Tour is based on time. In many stages that Mark Cavendish wins, he gets the same time as all the other riders. He is just the fastest sprinter. However, in mountain stages, he may finish 30 minutes behind the leader of the tour because although good at sprinting he doesn’t have a good build for climbing. The winner of the tour will have to be good at time trials and climbing. Why does Mark Cavendish not Get the Green Jersey despite winning the most stages. Yes, this has happened 6 times, including Alberto Contador in 2010. The overall is just the fastest time. GC stands for General Classification (top overall). There may be about 5-10 riders in with a chance of the general classification (and getting to wear the yellow jersey). Does riding the Tour take years off your life? According to this study. Tour de France riders live longer. We observed a significant 41% lower mortality among French elite cyclists from the Tour de France, compared with the general male population. What is a race within a race? Sometimes, in a stage, there may be a breakaway of riders who are long way down the GC. They have no chance of getting into the yellow jersey, but they could win the individual stage. Therefore, there is one race for the day’s stage, but also the wider battle for the overall. The big GC contenders won’t mind too much if someone 40 minutes down on overall goes on a breakaway because it doesn’t threaten their overall position. 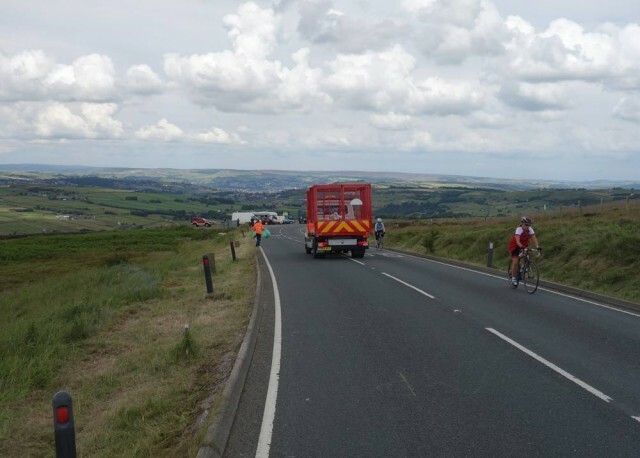 How come the Tour de France is starting in Yorkshire? Apart from the fact that Yorkshire is ‘God’s own county’, the Tour de France often starts outside France (usually every other year). This is partly in the spirit of pan-European friendship to share the world’s biggest stage race with neighbouring European countries. It is also because towns and regions will pay the organisers a lot of money to get the ‘privilege’ of hosting a few stages. The Tour de France will be an opportunity for a global audience of 1 billion people to see the breathtaking beauty of Yorkshire. The Tour is basically a three week advertising fest. Who was the Greatest Tour de France rider of all time? Miguel Indurain in 1991, 1992, 1993, 1994 and 1995 (the first to do so in five consecutive years). In terms of number of victories Lance Armstrong (7) stands out 1999-2006. Though there is now a rather embarrassing line through his name, after they were all stripped away due to drug use. To say Lance Armstrong completely dominated the Tour de France for a decade, his name is now only mentioned in hushed tones, as people quickly move onto other topics, like what a great rider Marco Pantani was. How many winner in the past 20 years can you believe won the tour ridding clean? Of winners in the past generation, David Walsh said he only had faith in Bradley Wiggins, Chris Froome Cadel Evans, and Greg LeMond. I would agree with that. Perhaps also Carlos Sastre, I don’t know. Who was the least well known rider to win the Tour? In modern times Óscar Pereiro was undoubtedly a surprise in 2006. He befitted from Floyd Landis’ disqualification. His only other major win was a stage in the Tour of Switzerland, and 10th overall in the Tour de France in 2005 and 2004. He is now playing football for Coruxo FC of the Segunda División B in Spain. Making him the best qualified football player to have the distinction of winning the Tour de France. Who was the Greatest Tour de France rider never to win? Perhaps an easier one to answer. Most people would give Raymond Poulidor or ‘Pou Pou’. His nickname was also the ‘eternal second’ Despite an 18 year old career which involved winning 189 races he could never win the Tour. He finished second or third a combination of eight times. Perhaps he just had the bad luck to be riding in same generation as Jacques Anquetil and Eddy Merckx. To make it even better he was an attacking rider, good in the mountains. In many ways we prefer a plucker loser to a ‘boring’ winner. ‘Pou Pou’ probably gained greater love than Jacques Anquetil or Miguel Indurain who ground out wins by dominating in time trials. The closest Tour de France? Everyone remembers the 1989 Tour. The American Greg Le Mond v the bespectacled Frenchmen, Laurent Fignon. On the last stage, a Time Trial on the Champs Elysees, Greg Le Mond managed to overturn a 50 second deficit and wins overall by a mere 8 seconds. Greg Le Mond made use of new technology – triathlon style time trial bars, leaving Laurent Fignon distraught at the side of the road. Most Popular Towns for Stages? The Most Scandalous Tour de France? It would be a mistake to think that scandal and drug taking are a modern phenomenon of the Tour. On the early tours, riders were specifically told they had to bring their own stimulants. Early tours were full of intrigue like riders being disqualified for taking the train or riders facing roads full of tacks to give their rivals an advantage. It was only in the 1960s when drug testing came in, and even then it was sporadic and by all accounts quite easy to dodge. However, for the sheer scale of scandal and upheaval it’s hard to forget the Festina Scandal of 1998. During the tour, Willy Voet a soigneur for the French team Festina, was found with a car full of doping products. The Festina team were sent home, and amidst drug raids by the authorities on other teams, the riders began to protest on mass. Only half the field finally made it to Paris, where Marco Pantani’s win was overshadowed by the massive drug controversy. (Pantani himself was later to tragically die young from drug related problems) Though perhaps even Festina scandal was overshadowed by the downfall of Armstrong. Don’t they all just dope – How can anyone ride the tour without? Many non-cyclists ask this. But, you definitely can ride and people do ride the tour without taking any illegal stimulants. Yes, the tour is difficult but it is feasible for professional athletes. Doping products just enable you to ride it at a faster average speed. In the EPO era, times up the last mountains were particularly quick, with big ‘fat’ 80kg riders going up steep climbs ‘on the big ring’. This seems to be no longer the case. Is the Tour cleaner than before? It is subjective, but I would say it is cleaner and there is much less doping. I think there has been a big shift in attitudes. I tend to believe people unless there is convincing evidence otherwise. Though decades of doping and lying have unfortunately created a suspicious mind in many cycling followers. Who has died whilst riding the Tour de France? Adolphe Heliére, France. Drowned while swimming during a rest day of the 1910 Tour de France. Most Bizarre Regulations in the Tour? In 1925 Herni Desgrange’s planned that riders should all eat exactly the same amount of food each day. Riders striked in protest and it was later dropped. Desgrange was famous for trying to make the Tour as hard as possible. He resisted allowing gears into the Tour for as long as possible. He said the perfect race would be one where only one rider was able to finish. In early editions of the tour, riders had to do their own mechanical repairs. In 1913, Eugène Christophe was on course to win when his fork broke on a mountain descent. He went to local forge and tried to repair his fork himself. As well as losing time, he was also fined 3 minutes, because a 7 year old boy helped push the bellows. What happens when a rider wants to answer a call of nature during a long six hour stage? Sometimes riders stop at the side of the road and many others will join them. There is an unofficial rule not to attack when riders are answering a call of nature. Sometimes when racing is hotting up, riders will not stop but urinate on the move. A task not too easy. They are not allowed to do it in built up areas and preferably not when cameras are on. You can get fined by the commissar, if you answer a call of nature in an ‘inappropriate place’! How Much Do they Eat during a stage? When Are you Going To Ride the Tour de France? Tell a non-cyclist I’ve won a local club time trial against a collection of other amateurs, and the next question is often – so when are you going to ride the Tour de France? It’s not quite like the London marathon where you can turn up with good intentions and promise to raise some money for charity. Only the top 20 pro teams will get invited to the Tour, and they will pick their best 9 riders. This means the field is limited to about 180 riders. Many great pro cyclists will not ride the Tour de France because they will concentrate on other great races in the calender like the Giro d’Italia or classics like Paris Roubaix. What’s the Most Bizarre TV Commentary you heard whilst listening to the Tour de France? Let’s be honest, the tour is mostly dull, only watching the breakaway time come slowly down. Fortunately, we have commentators like David Duffield who can manage to get excited by the most trivial of incidents. “This is like Wimbledon., Ascot and Silverstone all wrapped in together and plonked in the middle of Paris: amazing! But, to be fair, it’s a hard job commentating on cycling. 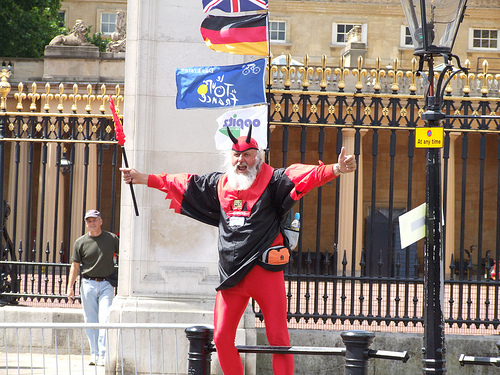 Why is there always a devil raising a trident by side of road? I’ve really have no-idea. You could always ask the devil himself but he seems to enjoy himself. What happens to all the litter thrown by the riders? After the stage, sweepers go and pick up any litter. Though now the Tour has designated areas for riders to throw their rubbish to try and reduce environmental impact of the tour. – Octave Lapize to Tour officials whilst half way up the Col d’Aubisque in the 1910 tour. In the days before tarmac roads, gears and heavy steel bikes. I now only have good days and great days. Armstrong out of the saddle all of the time now, dancing on his pedals, keeping his perpetual cadence going that DESTROYS the bike riders around the world. Phil Liggett TDF commentator on cancer survivor and seven times winner of the Tour de France. Lance Armstrong. 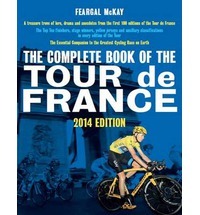 The Complete Book of the Tour de France – Fergal Mackay – A useful listing of all stage winners, jersey classification and description of every Tour de France in the past 100 years.